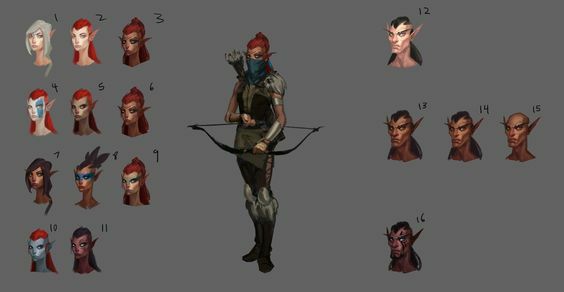 Given the elves in Embermark are a nomadic, tribal lot, help us design these fierce combatants. First, the female (the males are on the right for perspective and we'll vote on them later). Which ones fit, are best and why? Note: these polls only allow 10 entries, so if you're crazy about #11, chime in! I definitely like the nature-vibe I'm gettin from 9. Too bad there is not an equivalent on the male side. Great designs by the way, absolutely love the art style! I'm much more a fan of the hair up than down faces. I dunno if thats because the hair hides the sharpness of the facial features or what, but overall definitely like the pulled back/up hair faces better than the down ones. Also prefer the darker skin tone, gives more of a foresty vibe to them, to my eyes. I prefer the less giraffe-y necks. I know we're elves but the really long, skinny necks look frail. yeah i dig those too-- stay tuned for the male elf in-game soon and the female shortly thereafter!